Following the show we've had a number of questions asking how to make electricity from pedal energy. The principles of this substation are identical to those used for the Human Power Station except of course it was scaled up massively to support huge number of bicycle-generators. The mini power station allows you to safely turn DC power harvested from upto 5 cyclists and turn it into plain old AC electricity like you have in your home. The system uses a small UltraCapacitor (blue thing on the left) that servers to turn those ugly DC waves of erratic voltage into lovely smooth DC current. It also act as a power reserve; not too big to detach the cyclist from what every they are powering and not too small that if they slow down the power turns off, but just about right. 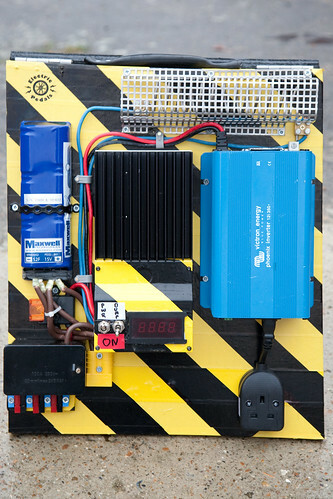 The box in the middle is a charge controller and ensures that if people are generating and no power is used that the system is protected. it sort of works like an overflow in a sink, except that the energy flows into a resistor (top left) and is transferred into heat. The blue box in the right is the clever bit that turns the DC in AC before energy goes to the plug socket. This system can be used for pedal-powered cinema, small stages, power a TV and DVD player, smoothie maker, XBOX etc. It's a wonderful invention and has already given many groups the ability to engage people while having fun!